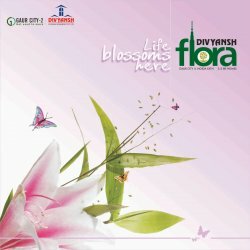 Divyansh Flora will redefine luxurious living as it is situated with in Gaur City 2 which is spread over 125 acres and has all the modern amenities required for a city life. Living amidst this rich green landscapes and multi-hued flowers will fill your life with a rich fragrance. Here every corner of this large complex has been aesthetically designed and even the minutest detail is taken care of. Adding to the charm of living in a planned township is the location of Divyansh Flora. An emerging city with a great infrastructure, Gaur City is an uncongested place and has a pollution-free environment with world-class facilities. For those who are in look out for serenity and refuge of nature as well as convenience of location, gaur city Noida Extension is the place to be. Swimming Pool and Club featured with Gymnasium, Billiards, Table tennis, Card Table etc. Lifts by OTIS/KONE/JOHNSON or equivalent in each block. Approx. only 25% covered area and 75% open space. Plumbing done with CPVC pipes to avoid corrosion.